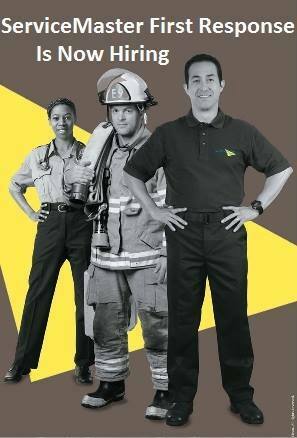 We are looking for a few GREAT people to join our team here at ServiceMaster First Response. We are one of the original franchises in Southern California tracing our roots in this community to 1960 when the doors were first opened. We clean up after floods, fires, mold and more. One of the requirements to work for our franchise is that you must be able to pass and maintain a Crime-Free Certification. This is a must for all of our employees. It is one of the many ways we bring true peace of mind to our customers at their time of need. We also support a drug free workplace so yes, we test. We have a full training program and have a team that loves to help customers when they have disasters in their home or office, day and night. We have been serving the High desert, mountain communities of Big Bear, lake Arrowhead, Crestline, Wrightwood as well as all of San Bernardino County from Hesperia since we opened the doors in 1960. We are currently looking for temporary part to full time helpers in our Fire/Smoke cleanup as well as Water Damage divisions. We also have a complete contents and soft goods restoration division. Most of our employees began as helpers and then moved up into their current positions. Please stop by the office and apply in person Monday through Friday from 8AM till 5PM.